A pair of Northwestern alumni have created the smallest satellite hotspot ever built and they hope it will change the way you explore the outdoors. James Kubik and Alan Besquin became friends when they met as first-year students at Northwestern. They both majored in Manufacturing and Design Engineering (MaDE) through the Segal Design Institute. While taking a course on industrial design, Kubik first began to expore the idea of improving technology for adventurers. After graduation, Kubik went on to work at Intuit while Besquin worked at Apple and then Tesla. The two friends stayed in touch and, during a camping trip, Kubik told Besquin about his idea for a compact satellite hotspot that keeps any smartphone connected off-grid. The two decided to collaborate in their spare time to create a working prototype. Then, earlier this year, Kubik and Besquin formed a startup together: Somewear Labs. Now, Somewear Labs is building the next generation of technology for adventure travel. We spoke with Kubik to learn how his experience as an undergraduate in the MaDE program helped shape his career trajectory and what advice he has for Northwestern students interested in entrepreneurship. Tell us about Somewear Labs, the startup you founded with fellow MaDE alumnus Alan Besquin. 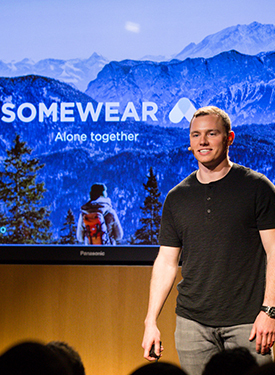 James Kubik: Somewear is an adventure brand reinventing how outdoor explorers use their mobile devices off-grid. Our first product, Relay, is the smallest satellite hotspot ever built and provides 100% global coverage. Once adventurers pair their smartphones to Relay and start using our mobile app, they get access to a community of explorers and locals sharing real-time conditions and advice. For people who prefer to leave their phone at home, Relay is used to share location off-grid and, in the most extreme scenarios, send out an SOS signal to emergency responders. We officially founded the company in January 2017 but had been working nights and weekends for a year to develop the technology. Pretty much every day after finishing work at our day jobs, Alan and I would meet up at a Starbucks and start what we called our "night shift." That let us hit the ground running with a working prototype once we transitioned to working on Somewear full-time. Our mission at Somewear is to make adventure more accessible. We believe creating a more digital outdoors will lead to safer, more collaborative, and more enjoyable outdoor experiences. What was the inspiration behind Somewear? JK: [Somewear Relay] came out of an experience where I lost a friend in a sailing accident. My friend went out sailing on Lake Michigan with her dad and younger sister, and somehow they got separated from the boat. Unfortunately they never made it back and when the boat washed up on shore, there was all this equipment on board that could've helped: a large satellite emergency device, marine radios, etc. They had all the equipment you would need to get help in that scenario, but, once you're separated from the boat, you're left without anything. I've been an avid outdoorsman throughout my life and that event always stuck with me. When I was a student at Northwestern, I had the opportunity to start thinking "What could have changed that scenario? What could have saved them?" And that’s where the initial concept for Somewear Relay was born - a wearable connection to the outside world that any adventurer could bring with them. Your first iteration of the idea for Somewear Relay was made during a course called Industrial Design taught by Professor Greg Holderfield, director of the Segal Design Institute. Tell us about your experience taking that course. JK: I loved that class. So much of [Segal Design Institute] is about how design and engineering go hand in hand in a very practical sense. You’re doing both engineering and design at the same time in the same class and that’s the beauty of the MaDE program. With that said, Professor Holderfield was able to get us to step a bit outside of our engineering mindset and he really tried get us to consider "How would you think as a designer?" For me, that course was an opportunity to forget about technical constraints and focus on creativity. So, what came out of that Industrial Design class was a concept for Somewear Relay and a story around that. Afterwards, Professor Holderfield offered to work with me in an independent study where we took the initial concept and started building it out: thinking about the brand and experience that we could build around this. How do you think what you studied as an undergraduate at Northwestern has influenced your career? JK: I did the MaDE program and the IMC Certificate [from Medill]. MaDE really makes you think cross-functionally. That's because of how they’ve structured the program, the type of projects you’re doing, and the fact that you're working with people who might not also be engineers – they might be from Weinberg or Medill or some other school. So, you're not just thinking about design and you’re not just thinking about engineering. Sometimes you're thinking about communication or marketing. After working in industry, I realized that cross-functional workers and thinkers have a huge leg up in the workforce. I worked as a product manager at Intuit for a number of years and found a lot of PM's focus on one aspect of product - the design, the architecture, the strategy. I think what makes the best product manager is when someone can jump into any point of the product lifecycle and make an impact. When you think in terms of the end-to-end experience, which is what MaDE really teaches you to do, you become an asset at a corporation. Then when you start your first company, it's an absolute necessity! Cross-functionality has just become my mode of operation and MaDE prepares you really well for that. What advice would you offer to Northwestern undergraduates who are interested in working at a startup? JK: Looking back, I've realized that college is this amazing time where it's incredibly low-risk to experiment and learn. I remember when I was in school I had an offer for this internship after my sophomore year. It was an engineering internship at a respected company and I thought "I should probably do this," but I turned down the internship. Instead, I worked on a Design for America project called Fruit Buddi full-time over the summer. I got a little bit of funding from [Segal Design Institute], and it was probably three of the most formative months of my life. It was my case study of entrepreneurship and really showed me a glimpse of a life that I would love: building, designing, and bringing products to people to really benefit their lives. I wouldn't have gotten that if I didn't take the risk. So, to anyone that's interested in taking that leap, I would say you are in the best position to go do it. Take the chance and go do it right now. And hey, if you fail, you're in an amazingly supportive and low-risk environment that will help you find the next move.